3PP has previously reported on the Google Art Project (GAP), a useful, free tool that allows users to access high resolution images of artworks from a selection of museums around the world. The GAP seems to also have a small set of critics, who not content with a free new tool in multiple languages, seek to compare it to other specialist resources, or even dare suggest that seeing a work on screen is not the same as seeing it in situ. While such commentators seem determined to point out the obvious, the rest of us can enjoy the revised version of the Google Art Project and the new museums added - now a total of 151 from the origina1 17. Since last year, the Art Project has expanded its reach : 151 museums are now partners (compared to 17 in V1) providing over 30, 000 artworks, from 40 countries (compared to 9 countries last year). Partners cover a very wide range of types of art, from sculptures to architecture and drawings and represent a great diversity of institutions, from the White House in Washington DC to the Rock Art museum in South Africa and the Museum of Modern Art in São Paulo. Particularly delightful to note were the additions to the number of works by artists featured at 3PP, I have included quick links to these below for those interested. 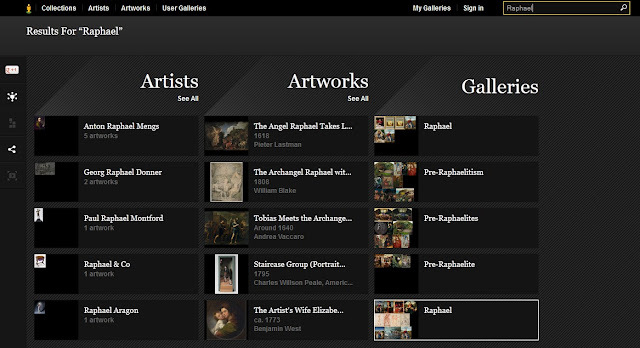 There is now also a search function embedded into the site, including a search/filter by artist name and/or museum name. The use of first names for the artists filter has perplexed some - rather than dwell on whether it is a good idea to list Raphael under Sanzio or Monet under Claude, I would simply suggest the use of the search box, which will find any artist, gallery or thematic entry with the name you input. It was pleasing to see the National Gallery of Art in Washington and Musée Condé in Chantilly added to the list of featured museums, each with some notable Raphael pieces. When navigating the site - clicking "details" launches a dedicated page for that piece, including a description of the work, including general provenance details in many cases, a welcome addition. The dedicated pages also contain links to additional content, including videos and audio. When there is a little yellow figure next to the name and details button - this means that "museum view" is also available for that piece - so you can see its relative position and scale in the gallery. One of the criticisms aimed at the primary version of the site was the lower quality of the "museum view" images. These have now been improved, with crisper images. Walking around in the museums with the street view technology is still a little clunky, but gives us a glimpse of the physical layout of the pieces and their relative dimensions, not to mention the frames, often not seen in catalogue publications. In the Raphael and Andrea del Sarto room at the Uffizi, we now have a clearer image of the cramped space where some of Raphael's wondrous works are (perhaps unfortunately) still housed. The fully restored Madonna of the Goldfinch seems to radiate lively colour off the dull white wall, and the "museum view" shows us the controversial self-portrait of Raphael is presently on vacation in an exhibition in Rome. It was a delight to see many of the NGA Washington's Raphael pieces included. Despite my ongoing study of Raphael, I may never have the chance to visit Washington and see any of these pieces at such close proximity. It was simply wonderful to zoom in to see the contentious inscription on the famous Saint George and the Dragon. Initially argued by some scholars to be a later addition, and noticeably missing a letter of the artist's name. More recent technical examination has since proven this inscription to be part of the original paint layer (Christiansen). One of the videos of a famous Renaissance piece that has been covered here before can be viewed below - Giovanni Bellini's Saint Francis in the Desert. Kudos to CED for their amazing work. The update to the Google Art Project is a welcome indication of the project's ongoing commitment to promoting the arts via the web. Useful new additions have been made in response to user feedback and input from participating museums, with further upgrades and innovations promised. The primary aim of the project has always been to promote free public access to information on museums and their works. For researchers and educators, the tool provides a useful source of information and high resolution images, which are always simply a link away. It will be interesting to note the development of the project and its uptake in the education sector. As always, there is room for improvement, but when has this not been the case with any globally inclusive endeavour? Kudos to Google and their partner organisations. My belief for the Google Art site is no matter how grand it becomes, and it is truly an amazing piece of work with so much future potential, that never will all of the people be completely satisfied. This I’m afraid is human nature...to look and try to find flaws instead of enjoying the bounty. After reviewing the link you provided for Artsleuth.com video on Bellini, I went to Artsleuth.com directly and the CED site came up. It shows 4 video options but none are Bellini. Is the Bellini video located elsewhere? and are there more videos there as well? Maybe I am not seeing the obvious. Hi Jeff! Thanks for the comments! I agree - for some it is far easier to criticise than to celebrate hard work being done to provide a free resource in multiple languages. Luckily these folks are just a minority and generally have zero control over anything other than their own opinions! As for the videos, I should clarify that text that appears in red (either in the post or in the comments section here) will lead to an external link. Hence, the best place to find all of CEDs videos in one place is their YouTube channel. From there you will see the Art Sleuth videos organised under a playlist, along with other playlists that may be of interest too. As mentioned, individual videos are of course also embedded into the Google Art Project itself for the particular work described, and can be viewed on the dedicated "details" page for that piece. I find it bizarre that the search by artist's name is by first name only?! Though I guess one can easily just search for the artist. That said I like it and it is great when it fills gaps left by galleries who haven't really made their images readily available online (like the Uffizi), or who have dismal, un-user friendly online databases or only very small images. I haven't done ay teaching since it was released but I think it has loads of potential as a teaching tool, the searching is basic and intuitive and the ability to see how the work hangs in the gallery is great. Hello Katya! Thanks for the comments. The high-res images are definitely the star attraction for me, but so many new facets in there to explore - particularly the education section. The search by first name may seem weird if you approach art from the perspective of the 17C onwards - as someone who spends most of my time looking at Renaissance works - Sanzio, Buonarotti, Barbarelli, Filipepi and Vecelli are less familiar than Raphael, Michelangelo, Giorgione, Botticelli and Titian! Of course, the search function will get you to Monet quick enough if you cant remember "Claude" in time! I work on Renaissance art too, really only those most famous High Ren artists who are known by first names most of the rest known by surname (and there are later exceptions like Claude Lorrain). To me it would make more sense to do what some galleries do and group by surname overall with double entries for those best known by their first name, especially considering the number of artists in Google Art known only by a first initial. It seems representative of a shift toward grouping people by first names in modern life (have noticed gmail organises contacts this way etc), but it's not really that great for something that deals mainly with historical figures. I know I can just search for artists very easily (and the search function is excellent) but if I want to browse by artist I would prefer to do it by surname. I have a bit different experience with museums. While the Musée des Arts décoratifs is one of my favourite places on Earth, a lot of other museums were... not bad, but "less than". A bit of that feeling owes to herding of the visitors, the pace at which we have to see everything or miss out ("There's 15 km in this museum and it closes in 5 hours, we got inside after waiting for an hour and a half in line, run, run, run! "), the back-pain... but some colours seem duller than in a catalogue or on a screen, much duller (photographers "embellish", but is it too much, is it setting up unrealistic expectations? ), and some works are so large that it's easier to take them in when they're sized down. Thank you for linking to the CED channel, it'll be a pleasure going through its videos C: . Nice coverage of the GAP updates! The educator's site is quite interesting to me, and I've spend some time wandering through the "Look Like an Expert" section. Some of the details and suggestions that they have provided are nice (although not completely comprehensive - i.e. "fresco" is only described as wet fresco, which is a wee bit misleading in my opinion). But I do like all of the zoomed-in details and images. Some of these topics (like "signature style") are difficult to teach in a classroom without the right detail images. I hope the GAP will allow educators the opportunity to teach certain topics with more ease. I have to admit, though, that looking at some of the paintings with impasto makes me long to see the paintings in-person. I wish I could be in the same physical space with such tactile surfaces! A similar comment for the Collection name: it would be more helpful to search by city. But I guess it's only a matter of time that alternative search options will be available. It is great that the project is multilingual but the FAQ is still only in English. @Bender - If I were Google, trying to maximise the amount of people finding things, I would not be listing any of those variations so early in the life of the search engine. Not many folks other than specialists (or those like us with a decent amount of reading under our belt!) know these permutations. Their primary aim in V2 seemed to be adding more Museums, as the project leader Amit Sood clarified. I wonder what subsequent iterations hold - I have a feeling it will go down a social media and education path rather than turn into an esoteric specialist resource. Time will tell! Thanks for the post. Although I read about it, I have to confess I didn't go into the new and improved version of GAP till I read this post. It is impressive and very useful even though there is room for improvement. I was particularly impressed that they had two museums from Istanbul. Of course, nothing can compare to experiencing the works of art in situ but ... this is a great alternative. Also I would like to hope that GAP will help to reach and spark the interest of a broader audience who normally wouldn't be interested in visiting museums. One can only hope. Thanks for this post, Hasan! I have to admit that I started my own and gave up in frustration. I was frustrated with features that others mention above, as well as the difficulty in creating galleries. Thank you for pointing out all of the great features of the GAP -- yes, the zooming is fantastic -- absolutely breathtaking sometimes. And it must be a great teaching tool. Thanks for the positive perspective -- I really appreciate it!